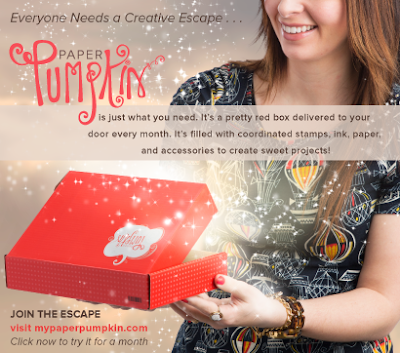 Playing with Papercrafting: Playing with Pumpkins! With this card, I embossed the bottom 2/3 of the card using the retired SAB embossing folder "Vine Street", but any similar folder would do. The cool thing about the card stock being printed instead of dyed is that you can sand it and the colour comes off, so it's easy to distress it. Then I just added the polka dot paper and embellishments to the top 1/3 of the card. When I stamped the sentiment, I had to mask the parts I didn't want to include on the two areas so I wouldn't get any ink on the parts of the rubber stamp I didn't want. For this one, I just took the leftover polka dot paper and several different circle and scallop circle punches and punched out different sized circles and adhered them to the card. I overlapped the card edge several times and trimmed to the shape of the card. I tried to keep the lighter ones at the top and the more saturated colour towards the bottom. And that's all there is to it! What's new at Stampin' Up? Seems like there is always something going on there. Today there is just a reminder that you can now purchase the Petite Curly Label punch that was a Sale-A-Bration reward, right up to May 31, 2013 and we'll have to see what's in the new catalogue after that!